Herebelow some of the many answers given in response to E-mail messages by readers of my CINEMATOGRAPHICA page, asking for information, offering items for sale, or looking for them. Where can I buy/sell equipment? What is the value of my camera/projector? Where can I buy spare parts and get service? YOUR QUESTION: Would you like to buy a camera/projector/film I have? ANSWER: I do not buy apparatus anymore unless they are of special interest to me. Have a look at my 'Want list' (click) to get an idea of my interests. However, bear in mind that I am living in the Netherlands and that purchase would involve quite steep postal charges. So cheaper items are not worth the expense. Regular 8mm or 16mm movie cameras and projectors. QUESTION: Where can I buy/sell equipment? ANSWER: I am often receiving requests such as where can I buy a projector to show old films, or where can I get parts. First of all I am living in the Netherlands and do not know the situation in your area. I do not stock parts either Almost noone does). Some of them have equipment for sale. You can also offer items for sale in forums or chatgroups. Apparatus like super 8 projectors might well be bought in garage sales, second hand shops like 'ca$h converters', or pawn shops in your vicinity. It saves you the expense of transport. Look or advertise in local house to house weeklies, often for free. There is a lot of such equipment around. Ask for my list of items I have for sale specifying size and whether it is for collecting or use. Most of them are collectors' items, though. QUESTION: Can you tell me the value of an apparatus I have? ANSWER: Most of the apparatus I receive queries about are quite common and are hardly of collectors' interest. I do not have particulars of all of them on file. But let me say that so many cameras and projectors have been sold, especially after WW2, that they are seldom a rarity. Only pieces of sophisticated equipment manufactured in small quantities at prices far beyond the means of most filmers at the time are in demand nowadays. The value of common cameras or projectors may vary from $ 5 to $ 50, or may be more. There is a thin market for cinematographica and in general each piece of equipment is worth what you can get for it, depending whether you meet a knowledgeable person (who pays normally less than then the newcomer! ), a keen collector just in need of that particular item, a person who needs to use it urgently, or somebody else who just buys it for trade. QUESTION: Where can I buy spare parts and get service? ANSWER: For addresses have a look at my 'Service' page by clicking here. In general do not expect parts of old prewar equipment to be available. You will have to consider buying another apparatus, either in replacement, or for parts. Question: I have acquired an old movie camera. Are regular 8, super 8, 9,5, or 16mm films still for sale? ANSWER: Yes, they are, but they may be hard to come by. Visit the sites at my link page for further news about availability. As for regular, or double 8 films and 9,5mm films, these are still being produced/re-perforated to order and supplied by certain dealers/societies. Magnetic sound films are not produced anymore to my knowledge. See also my links page. In general if you wish to go into movie making remember that costs are considerably higher than video: 8mm may cost more than $ 10 per minute, 16mm at 24 f.p.s. (sound speed) up to $ 25 per minute! Bear in mind too that there are no labs anymore to process Kodachrome film for lack of appropriate chemicals. Look at my links page for sites dealing with 8 or 16mm filming. Some have more info on where to buy film stock. QUESTION: I have some old 8, 9,5, 16 or 35mm films. How can I show them? Who can transfer them to video/DVD? ANSWER: As for 8 and 16mm you might consider buying an inexpensive old projector of the sixties or seventies (see above). But mind you, these are old projectors so make sure that they still function well. Even better have them transfered to video professionally. Laboratories have far better equipment and cameras to obtain high-quality results and the cost is not that very high either. I myself have my films digitalized by a laboratory so that I can make DVD's of them and video clips for YouTube! Bruce Mayfield's '8mm Film Transfer Film to Video / DVD', with tutorial. High Sierra Productions, Pacific Northwest transfers all sizes to video/DVD, USA. Film (8, 9,5 and 16mm) and video transfers to DVD by David Metcalf in Perth and Sydney. But you may also get in touch with your local photoshop. The most convenient (though not ideal) way is to use your own camcorder and film from the (preferably mat) projection screen. A variable speed projector may prevent frame lines traveling up or down the screen. Some video cameras have a 'slow shutter speed' option that eliminates the flicker to some extent. Read more on the subject here: 'Transfering motion picture film to tape - a basic primer' (Urbanski Film). After having obtained a digitalised file you can use an editing program to rearrange shots and add sound. YouTube has a similar free service and copyright free music. QUESTION: I have bought a camera/projector and should like to have more info on it and a manual. F. and S. Marriot also share their collection of manuals of Beaulieu, Bell & Howell, Bolex, Ercsam, Nizo, Path� Baby, etc. Oldtimer Cameras Ltd. (Great Britain) has a host of xeroxes of manuals for sale. BJ's scanned copies of (some) manuals. Warton Parfitt in the U.K. has (copy) manuals and reproductions of magazines. Question: I have come into possession of a film with a certain title. Do you have an idea what it is worth? ANSWER: No! I am not a collector of films except for vintage private amateur movies. I have no expertise to assess the value of commercial movies. Look for other sites at my links page, newsgroups, forums. Question: I am interested in opening a (drive-in) theater in my area. Can you give me any information on the type of projectors that I need for this venture, and where can I obtain them? ANSWER: In the past I have been asked various times this type of question although it falls quite beyond the scope of collecting vintage movie equipment and my expertise. At any rate your decision is dependent on where and at what price you may rent your films, video's, DVD's, or Blu Ray discs. As for film, in what size: 35, 16 mm, or super 8 (for screens up to 6 feet, or more with Xenon lamp projectors)? Size of the film/dimension of the screen is again dependent on the expected number of people to attend shows. If you expect a small audience I should consider seriously widescreen video because of the availability of titles. Your own expertise is also important. Are you a handyman being able to fix all sorts of malfunctionings of the (often vintage) projector? Or can you avail yourself of the services of someone? Finally, you will have to find out whether you need permits, levy tax on entrance fee, licenses, etc. etc. There may be much more involved than you are aware of! 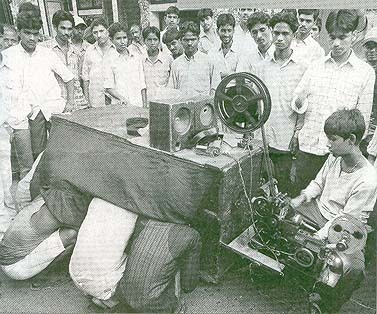 Movie peepshow in the slums of Calcutta on a late 19th century Japanese projector.